The "Vision of the Lampstand and Olive Trees"
inadvertently influence their thoughts, such claim they rely solely upon the Holy Spirit to teach them. be negligent in our search if we did not heed the counsel of these agencies. to what this vision represented, and sought answers. exercise our God giving ability to reason things out. represents the Holy Spirit, the “spirit of truth” in other words the “Word of God”. 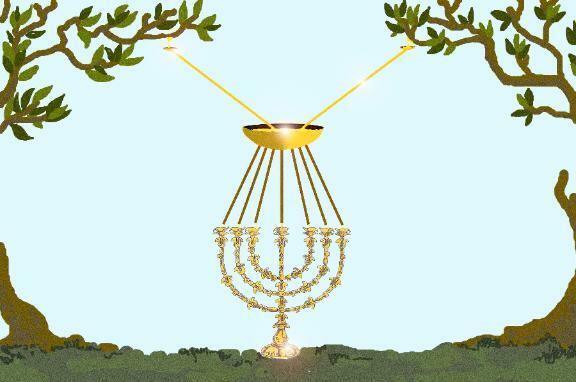 referred to as the “two olive trees”, the Old and the New Covenants or Testaments. stages or periods of the church throughout its history. pipes below the bowl represent? to the Church, and subsequently to the world in general. seven pipes) to dispense the “oil” or truth to the body. there the oil was distributed to the various branches. human agencies the Lord has chosen. which we are receiving our nourishment is of the Lord and not of man.